Home » All society » You’ll Never Walk Alone – Justice for the 96. 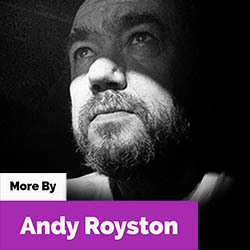 Andy Royston remembers the 96. (originally published by Ayup Online Magazine, 2000). For English football fans it is a moment etched in the memory, something never to be forgotten. The moment we heard the news. 96 lives lost in a crush of people at an FA Cup Semi-final football match taking place at the Hillsborough Stadium, Sheffield. A moment we’ll never forget. The moment when the game stopped. The occasion was supposed to be one of celebration, Liverpool FC and Nottingham Forest met in an FA Cup semi final at a neutral ground in Sheffield; a beautiful sunny day in the spring of 1989. The turnstiles at the ground had opened at 12 noon, three hours before kick-off and the atmosphere was good-natured. However somewhere between 2.30 and 2.50pm a crush grew. Turnstiles by the West Stand on Leppings Lane struggled to cope with thousands of fans trying to gain access to the ground. At 2.52pm the police superintendent on duty received permission to open a gate into the ground, Gate C, and did so. In five minutes around 2,000 fans moved through this gate at a brisk walk, most heading straight down the tunnel directly ahead which led at a gradient of 1 in 6 to a tightly fenced pen of terracing in the lower West Stand. An area already completely full. The gradient and momentum created a domino effect as thousands lost their footing and became unable to control momentum or direction. Unchecked, more and more behind were swept into the long dark funnel of a tunnel beneath the West Stand. Stewards and Police at pitchside at first seemed to see the situation as a public order problem and pushed escaping fans back over the high perimeter fence. Fans spoke of being swept through, feet completely off the ground. Pressure became unbearable. People became crushed against crash barriers and high metal fences at the front of the pen. The game kicked off as planned at 3pm. Six minutes later the referee halted the game and the Police chiefs, in a control room overlooking the pens, abandoned what they perceived as a crowd control problem and confronted a major disaster. 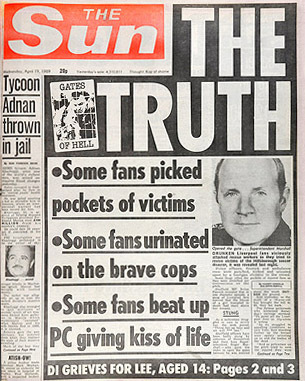 Front page of The Sun on 19 April 1989, Edited by Kelvin MacKenzie and published by Rupert Murdoch. The causes of the tragedy were not “drunken hooligans” as portrayed by Kelvin McKenzie’s London-based tabloid The Sun. Just thousands of ordinary big city soccer fans arriving late after delays on the motorways, at coach parks and the railway station. No-one felt it necessary to delay the kick off, resulting in fans redoubling efforts to gain entrance to the match (Just the week before, some Liverpool fans had missed a game’s opening goal due to late arrival). A decision was made to relieve the congestion by opening a large gate, but no effort was made to seal off entrances and redirect fans to safer areas, decisions that had serious and fatal consequences. This was compounded by the slowness of officers to react to the crush inside the two pens (overlooked by a police control tower) and the failure to mobilize a major incident plan for the stadium until it was far too late. These failures were compounded by official emphasis on crowd control over basic crowd safety. To make matters worse after the incident Police and FA Officials made statements that set the tabloid press into a frenzy of mistruth and lies about what happened. Fans themselves were demonized to such a degree that Coroners took blood samples from the dead to check alcohol consumption. Inquests took place in an atmosphere of blame and recrimination with the surviving Liverpool fans with nowhere to turn for support. Behind the scenes, we now hear, South Yorkshire Police embarked on a process which reviewed and altered their officers’ written recollections. The astounding thing is that this was not the first time that the West Stand of Hillsborough Stadium had seen an overcrowding crisis.Back in 1981 the Wolves v Spurs FA Cup semi-final was played at Hillsborough. Fans were shepherded by a massive police operation designed to keep rival fans apart – an operation that ensured that Wolves fans had the then enormous open east bank -the Kop – while Spurs, despite having the bigger following, were allocated the much smaller West Stand area. Here problems in the pens occurred well before kick-off as it became clear that there was massive overcrowding in the Spurs end. People were being pressed tight against the metal fences. Police then allowed effected supporters out of the enclosure, where some watched the match from pitchside. One or two were treated by the St Johns Ambulance but luckily there were no serious injuries. The Football Association however were concerned enough to move FA Cup Semi-final matches away from the ground for six years. The management of a major sporting event is a complex procedure involving commercial organisations, sporting bodies, police, fire, health and ambulance authorities and governmental departments. That it all came down to blame and scapegoating is a failure of all of these officials. 96 people did not lose their lives because of the actions of just two people. Factors such as resource allocations, neglect of safety issues, communication failure, cost pressures, emergency procedures, crisis management procedures, all played a part. 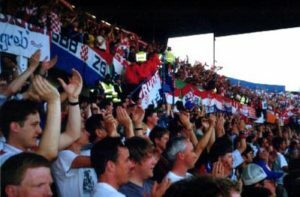 Croatia supporters during Euro96, viewed from the front of the Lower West Stand of Hillsborough. By 1996 Hillsborough, like all major British football stadia, had been transformed into a fully seated arena. The area at the front of the stand now has no wall or perimeter fencing and the area continues to host traveling supporters of teams visiting Sheffield Wednesday Football Club. Seven years on, at the Euro’96 tournament, policing around Hillsborough’s West Stand was so very different. In response to the Hillsborough deaths the transformation of the Leppings Lane end was remarkable. All seater. Courteous stewards. Subtle filtering of fans towards the turnstiles. No bottlenecks. Croatia fans in the West stand roared their support for star striker Davor Suker against Denmark. These fans were festooned with all manner of “offensive weaponry” (flags and banners), some standing on the edge of an unfenced balcony. A small blond hatless police woman could be seen right in the middle of the crowd calming the situation, with great success. The occasion was a football festival and the organization immaculate and friendly. The game turned out to be the finest of the tournament and one of the best games ever seen at Hillsborough in its 100 year history. One thing that was not in evidence at Euro ’96 was any kind of memorial at the stadium. Nowhere for us, as football fans, to pay our respects. At the Croatia Denmark game many who walked down the fateful tunnel beneath the West Stand told me they had said a little prayer for the dead as they took their seats. The Owls fan in front of me, who normally took his seat in the “home” stand opposite, was deeply moved to be watching the game from such a spot. The years since the tragedy had seen official statements, silence and inaction that were not just insulting to those immediately connected to the events of 15th April 1989 but to anyone who loves the game of football. From the 200+ Liverpool fans who were injured inside Hillsborough, 500 more effected by it in other ways, the SWFC stewards, the rescue services who were unable to gain access to help, the players on the pitch, the stadium ground staff, the doctors and nurses at the hospital, the ordinary coppers failing in extraordinary circumstances, the horrified friends and relatives watching on TV screens at home… and all who still shed a tear as they remember. Insulted and embarrassed by the silence and inertia of officialdom, and the bluff comments by politicians like Bernard Ingham who refer to “tanked up yobs” and opine that people should “shut up about Hillsborough”. The effects of a disaster of this magnitude go very wide indeed. There are those who experience the disaster directly, relatives and friends of victims, rescue and recovery workers, people in the local community who share the loss and grief, witnesses and helpers, others who but for lucky chance would have been involved themselves. This is where officialdom should adopt a more sympathetic and responsive attitude to those involved, not just avoid the issue, look after their own and expect everyone to forgive and forget and move on. South Yorkshire Police, The Football Association, Sheffield Wednesday officials, Conservative and Labour government ministers. All failed to accept corporate/collective responsibility, leaving us for decades with the sense that justice has not been done. The Taylor Report, commissioned in the aftermath of the disaster, reported a “general malaise or blight over the game” back in 1990. For all the flashy stadia and huge wages in football today the welfare and opinion of the ordinary fan still feels marginal and unimportant nearly thirty years on. Confidence in footballs officials is no more in evidence now, in our expensively stewarded plastic seating, than when we were herded around like cattle into barbed wire pens. The announcement in February 1999 that there would be a lasting monument to the Hillsborough tragedy in Sheffield was long overdue but very welcome. A garden and plaque by the main access bridge to Hillsborough was dedicated to the victims following 10 years of protesting from bereaved families. It was unveiled before a league fixture between Liverpool and Sheffield Wednesday, a few weeks after the disaster’s 10 year anniversary. Floral tributes were laid and 96 seats were left empty before the game – a single red rose placed on each one. Bishop of Sheffield, the Rt Rev Jack Nicholls, led a minute’s silence. It was a game boycotted by many Liverpool fans in protest at the lack of a memorial and the treatment of fans during preceding years. I was at work when I heard the news from England that Britain’s longest ever inquest had finally ended. A verdict was returned that the Liverpool supporters were unlawfully killed due to deficiencies in policing and ambulance response on the day, as well as the stadium’s design, and reiterated that supporters were not to blame. I shed a tear for the 96, knowing that I am now older than just two of the victims of this tragedy. This still means so much to football fans. In the interim I’ve seen many hundreds of football games and dozens of grounds across the country. I’ve rarely watched a game without thinking of the ’96 and their valiant families who have fought officialdom for 27 years to find closure. That we had to wait almost two generations to wipe the slander and innuendo away leaves a bitter taste. The senior police, politicians and journalists who spread rumor and lies now need to be held accountable. Justice has yet to be served. Yes, well done, Andy. This is a very balanced account of what happened on that dreadful day. It is clear now that senior officers in the South Yorkshire Police actively conspired to save their skins by instructing lower rank to change their statements to chime with the ‘official’ senior police version of events. This police force has suffered from a number of major senior police misjudgements in recent years, and particularly their silence and lack of action over the child grooming of scores of young girls, spreading back over many years, in the Rotherham area. The Chief Constable has now been suspended, and there are calls for the amalgamation of this force with other constabularies in Yorkshire. The pity of all this is, that the ordinary constable on the beat, doing his or her job properly and serving their local communities well, day in day out, are tainted by the incompetence and craven behaviour of their senior colleagues. Brilliant, very well written Andy.